Obituary for Jimmy Woodard Garrell | Inman Ward Funeral Home of Tabor City, LLC. 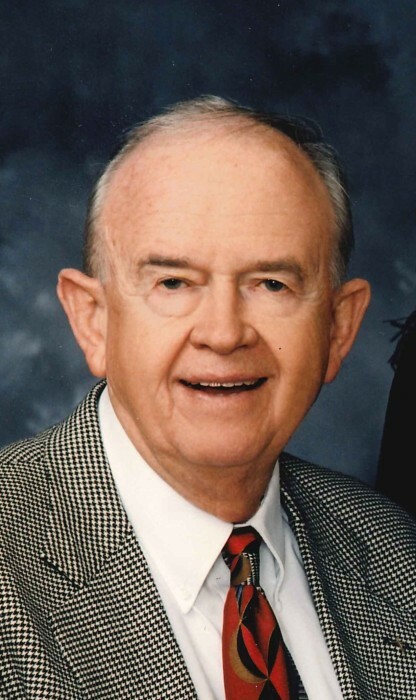 Mr. Jimmy Woodard Garrell, age 82, of Britt St., Tabor City, NC, died Sunday, June 10, 2018, in the Grand Strand Regional Medical Center, Myrtle Beach, SC. Born July 21, 1935 in Marion County, SC, he was the son of the late Brightly Alton Garrell and Doris Woodard Garrell. He is survived by his wife: Martha Jo Hayes Garrell of Tabor City, NC; one son: Ray Lupo-Garrell and wife Vickie of Green Sea, SC; one grandson: Justin Ray Lupo-Garrell of Florence, SC. In addition to his parents, he was preceded in death by his brother: Joe Cephus Garrell. Jimmy Woodard Garrell has lived in the rural Columbus County town of Tabor City, NC in the southeast corner of the state his entire life. When thinking about where he might attend college, it didn't take him long to decide he wouldn't consider going anywhere else but The University of North Carolina. He liked its diverse student body, the atmosphere on campus and the reputation of its School of Commerce. He graduated from UNC in 1958 with a Bachelor of Science degree in Business Administration and then went into the family produce and canning business. Sometime thereafter he got involved in convenience stores and the oil and propane business starting Yam City Oil and Gas Co. While growing up, H.G. "Doc" Dameron, Jimmy's neighbor, began taking him to UNC football games. His loyalty thus began at an early age and after graduating from Carolina, Jimmy joined the Educational Foundation and has been a member now for over 50 years! Jimmy and his wife of near 43 years, Martha Jo, established an endowed scholarship in 1986 and named it the Tabor City Basketball Scholarship. Asked why, Jimmy replied, "Small town pride." Tabor City has a population of roughly 2,500. Beyond the scholarship, Jimmy and Martha Jo have supported just about every other project with which The Educational Foundation has been involved from Kenan Stadium to Boshamer, the Williamson Athletics Center and everything in between. As the saying goes, Jimmy noted, "My blood runs Carolina Blue." Jimmy added, "I have been fortunate to be able to assist and want to help the overall program due to its leadership and top notch staff. It is a program run with great integrity." Not only has Jimmy supported Carolina Athletics and The Educational Foundation financially, he has also served on the Foundation's Executive Committee from 1996-2001 and its Board of Directors from 1993-1996. He also supports South Columbus High School, Southeastern Community College, the Guidepost Foundation, the Child Evangelism Fellowship and Cape Fear Hospice among many other charities. Additionally, he established the Kenan-Flagler Award for Excellence in Business Communications at UNC. Jimmy just seems to want to help wherever he can. To add to his list of honors, Jimmy is a Carolina Living Legend, a title given to those University of North Carolina alumni whose graduating class has had its 50th year reunion. Jimmy also received the Order of the Long Leaf Pine, the state of North Carolina's highest civilian honor earlier this year. When asked what the award meant, Jimmy, in his usual unassuming way said, "It was an extreme honor, especially to be mentioned with people like Michael Jordan and Bill Friday." Given all he has done for the University, Jimmy could certainly be considered one of Carolina's priceless gems. A Side Note: Jimmy can be heard on the award-winning beach music radio station 94.9 The Surf in North Myrtle Beach, doing Jimmy G commercials. His tagline is "Give a smile away every day". Funeral services will be held Wednesday, June 13, 2018 at 3 PM in the Tabor City Baptist Church. Burial will follow in the Green Sea Cemetery. Visitation will be held from 1:30 to 3:00 PM prior to the service in the church. Memorials may be made to the Tabor City Baptist Church, P.O. Box 126, Tabor City, NC 28463 or the Green Sea Cemetery, 16806 Swamp Fox Hwy. East, Tabor City, NC 28463.